This is a big one, guys. This is one of those recipes that like...changes your life. Ok...maybe that's dramatic. 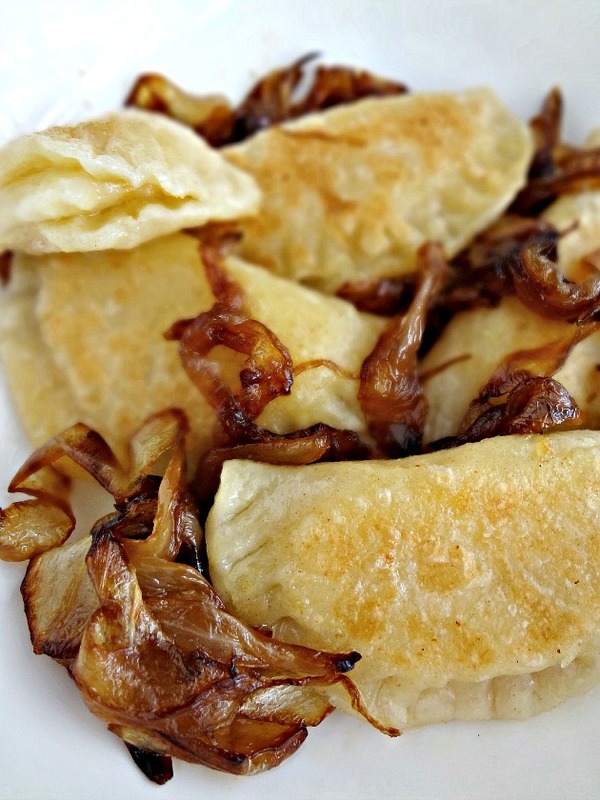 Now, first of all, if you aren't familiar with pierogi: they're pretty much a pasta that is filled with mashed potatoes (and, in this case, cheddar cheese) and usually served with sauteed or caramelized onions. There's a bunch of variations but, in my opinion, this version is the best. The pasta shell is tender. The cheddar mashed potato filling is perfectly flavorful and comforting. Sauteeing the pierogi in butter after boiling makes the texture and flavor even better. And serving them with caramelized onions is just perfection. I'm legit. obsessed. Michael is too. He took one bite and gave me a wide-eyed look, "These are amazing!" He was impressed. I was sort of impressed. You'll be impressed. 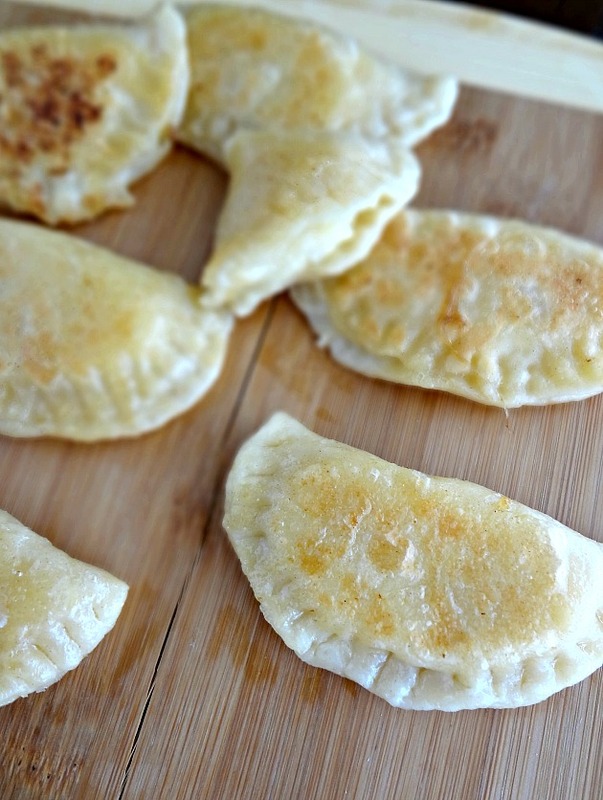 If you need a perfect pierogi recipe-look no further! Or, if you just want a new idea for dinner tomorrow-also look no further! 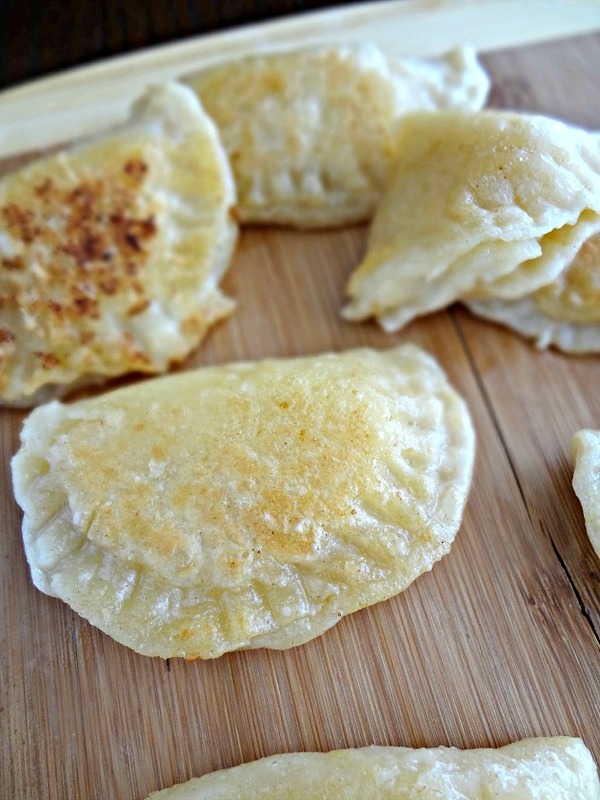 You need homemade cheddar pierogi in your life! Mix together the flour and salt. Stir in the egg-the dough will be clumpy. Stir sour cream and room temperature butter into the dough until it comes together into a ragged, slightly sticky, ball. Knead and fold the dough by hand until the dough is more smooth (try to avoid using extra flour--if necessary use just enough to keep the dough from sticking to the bowl/your fingers). Wrap the dough in plastic wrap and refrigerate 30-60 minutes, or up to 48 hours. Meanwhile, to make the caramelized onions: Heat 1 tbsp. butter + 1 tsp. olive oil in a large skillet over medium-low heat and add the sliced onion, stirring until fully coated in the butter/oil. Cook on medium-low heat for approx. 45 minutes, stirring the onions every 5 minutes, until soft and brown. Towards the end of the caramelization process add a little bit of broth or water to the pan to help you scrape up any brown bits from the bottom of the pan and mix into the onions. Once finished, set aside until serving with pierogi. To prepare the filling: stir together warm mashed potatoes and cheese until fully combined-taste and add salt and pepper, if desired. Wait until the potato mixture is cool to the touch before filling the pasta. On a lightly floured surface, roll out half of the chilled pasta dough until about 1/8 of an inch thick. Use a 4 inch cookie or biscuit cutter to cut out circles of dough. Repeat with other half of the dough. Combine all the scraps and re-roll and cut until pretty much all the dough is used. Place 1-2 tsp. of the potato filling in the center of each round of dough and then gently fold one half over the other, pinching to seal in the filling and form a pocket. Use the tines of a fork to seal the pierogi again. You can freeze the uncooked pierogi for 4 weeks, or refrigerate them overnight, or cook them in a large pot of boiling salted water. Only cook about 10-15 pierogi at a time, so that they have room to float without sticking. When the pierogi float (about 5-10 minutes) they're done! Drain and set aside. Melt a dab of butter in a large skillet over medium heat and add boiled pierogi, saute until golden on each side. 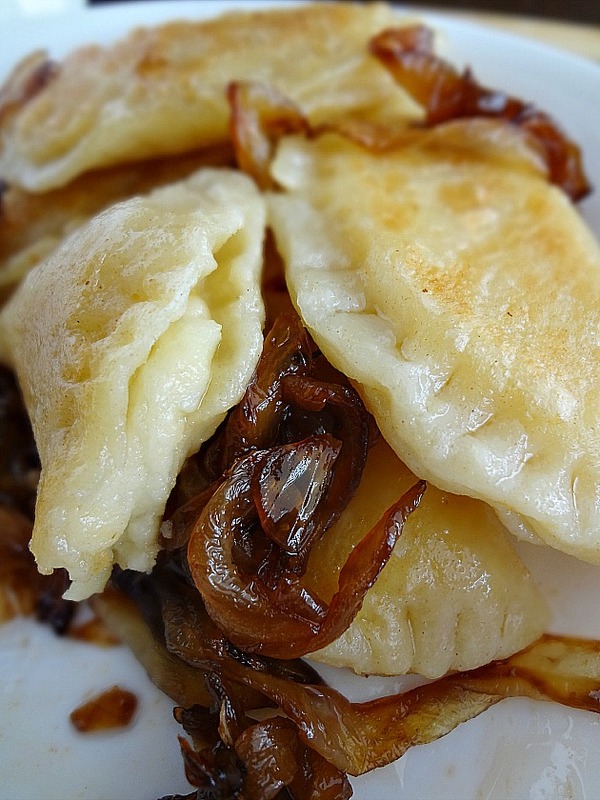 Serve pierogi warm with caramelized onions and, if desired, sour cream. Store leftovers an airtight container in the refrigerator for up to 3 days. I neeeeed to make these again very very soon!